In June 2007, following the tabling of the ‘Little Children are Sacred’ report, the Australian government introduced the Northern Territory Emergency Response Act, prescribing a number of drastic measures, some contravening the Racial Discrimination Act and others revolving around land use. 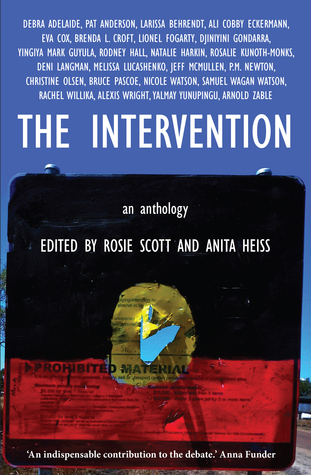 So Dr Anita Heiss and Rosie Scott introduced their article published a year ago in The Hoopla outlining the rationale behind their decision to crowdfund the publication of their anthology, The Intervention, after major publishers had turned it down. In their essay, Heiss and Scott refer to Olga Havnen’s summary of aspects of the intervention: the arrival of the army; the dismantling of Aboriginal-run organisations; the atrophy of CDEP or the Aboriginal “work-for-the-dole” program; the implementation of mandatory and universal welfare income control; the depiction of Aboriginal men as drunks and paedophiles, and women and children as helpless victims; and the introduction of alcohol controls; measures whose impacts had yet to be assessed. The Intervention provides just such language. A collection of fiction, essays, memoirs and poetry written by over twenty writers and commentators, both indigenous and non-indigenous, it details the varied impacts of the emergency response on remote Indigenous communities – almost all negative. Where we emphasised the need for resources and for flexible processes of engagement with Aboriginal families and communities, the Intervention emphasised external control and blanket provisions affecting all Aboriginal people. They included compulsory health checks of Aboriginal children to check for evidence of abuse, blanket quarantining of welfare payments … and the scrapping of the permit system that allowed Aboriginal people some control over access to their land. In other words, the actions of the government were further promoting the very conditions,”the breakdown of structures of authority and meaning”, that Anderson identifies as having contributed to the problems. Without community consultation and involvement, is it any wonder the impacts of the Intervention, outlined and dramatised so effectively in this anthology, have been negative? We are all aware in Australia of the horrific journey that Aboriginal people have had to take right from the beginning. People say invasion but I say on our first encounter… Trauma, emotional and mental, a lot of us are going through – tremendous, tremendous trauma and that’s not over exaggerating. It is one of the strengths of this anthology that so many diverse Aboriginal voices are represented in its pages, people who live in remote communities as well as those from cities or regional centres. Non-indigenous perspectives also make a valuable contribution: among them, P M Newton’s story, “567,000 kms Driven”, tells of the army’s arrival from a soldier’s point of view; while Arnold Zable offers the moving meditation, “Here is Where We Meet”. I heard that the last officially recorded massacre of Aboriginal people occurred in the NT in 1928. Wright makes her own contribution to the anthology with her short story, “Be Careful About Playing With the Path of Least Resistance”. In it she depicts a gifted boy who witnesses the panic engendered among the adults of his community by the arrival of the army, their sense of shame at the allegations of child sexual abuse, their confusion over why such drastic measures are being implemented, and their fear that their incomes may be taken away if children – like the boy – do not attend school. Wright depicts complex layers of these issues, the seeming lack of relevance of a Westernised education; the lure of nihilism that accompanies a loss of meaning, and its consequent risk of adolescent suicide; and the power and potentially redemptive qualities of traditional stories and the guidance of elders. Reading The Intervention, it’s hard not to conclude that, rather than solving the problems faced by remote Indigenous communities, the government’s actions have compounded them. While clearly action still needs to be taken, surely a first step towards helping would be for non-Indigenous Australians to recognise and respect the expertise of Indigenous leaders within the communities themselves, as well as to acknowledge the part our current and former generations have played in the creation of those problems. Given the lack of such acknowledgement and respect, it’s hardly surprising that several of the contributors to this anthology see the Intervention as little more than a cynical land and power grab. This book was read for NAIDOC week, inspired by the “reading for diversity” initiative of the Australian Women Writers Challenge 2015. Keep sharing such informative and engaging content.